Aims More than 50% of patients with heart failure have preserved ejection fraction characterized by diastolic dysfunction. The prevalance of diastolic dysfunction is higher in females and associates with multiple comorbidities such as hypertension (HT), obesity, hypercholesterolemia (HC), and diabetes mellitus (DM). Although its pathophysiology remains incompletely understood, it has been proposed that these comorbidities induce systemic inflammation, coronary microvascular dysfunction, and oxidative stress, leading to myocardial fibrosis, myocyte stiffening and, ultimately, diastolic dysfunction. Here, we tested this hypothesis in a swine model chronically exposed to three common comorbidities. Methods and results DM (induced by streptozotocin), HC (produced by high fat diet), and HT (resulting from renal artery embolization), were produced in 10 female swine, which were followed for 6 months. Eight female healthy swine on normal pig-chow served as controls. The DM + HC + HT group showed hyperglycemia, HC, hypertriglyceridemia, renal dysfunction and HT, which were associated with systemic inflammation. Myocardial superoxide production was markedly increased, due to increased NOX activity and eNOS uncoupling, and associated with reduced NO production, and impaired coronary small artery endothelium-dependent vasodilation. These abnormalities were accompanied by increased myocardial collagen content, reduced capillary/fiber ratio, and elevated passive cardiomyocyte stiffness, resulting in an increased left ventricular end-diastolic stiffness (measured by pressure-volume catheter) and a trend towards a reduced E/A ratio (measured by cardiac MRI), while ejection fraction was maintained. 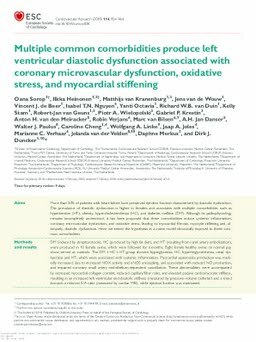 Conclusions The combination of three common comorbidities leads to systemic inflammation, myocardial oxidative stress, and coronary microvascular dysfunction, which associate with myocardial stiffening and LV diastolic dysfunction with preserved ejection fraction.